Julie Fritsch , NAAE Communications/Marketing Coordinator. Preparing for a changing industry. If you give a quick glance at any agricultural magazine, you won’t have to search for long before you start to see articles about the newest innovation in crop production. The next article will likely be about the many ways a young producer can gain a competitive edge or more likely an article talking about the newest emerging technologies in agriculture. Agricultural education programs across the country are given the task of preparing our students to enter all of these ever changing careers. At the post secondary level, our programs must stay at the leading edge of change to remain relevant. We must build upon the educational foundation that our students gain at the secondary level and develop the technical skills that are required to succeed in the industry, often as the skills needed continue to change with the technology. At times, this can be very challenging, yet exciting. One of the fastest growing areas of change is in the precision agriculture industry.Part of the mission of The Council is providing guidance and support for program innovation and to assist all ag educators in adapting our programs to prepare students for these changing industries. The Council's work with reinventing the SAE is an integral part of meeting this challenge. One of the best environments for students to obtain the skills is through an active SAE or internship. Often times, students will gain the most current and cutting edge skills right along with the industry professionals. This certainly is true in the rapidly changing precision agriculture industry and at post-secondary programs across the country. For many years professionals in school based agricultural education have strongly promoted a three component approach to building a complete educational program that utilizes classroom/laboratory instruction, experiential learning through SAE as well as personal growth and development through FFA. The visual representation of three circles intertwined has become a permanent part of our gospel in educating students, parents, supporters and administrators on how we intend to develop young people for careers and service to the community. As another school year has begun this process has started once again in thousands of communities across the country. Whether in a slide show or a published material such as a handbook or course catalog many will be guilty of presenting this diagram to audiences unfamiliar with agricultural education without the necessary context behind the visual to truly understand its meaning and what the intended outcomes will be for the young people who engage.Have you ever thought what our historical representation looks like to these audiences without context? Have you ever thought about how a visual representation that has been in service for decades compares with the terminology of professional education in the 21st Century? 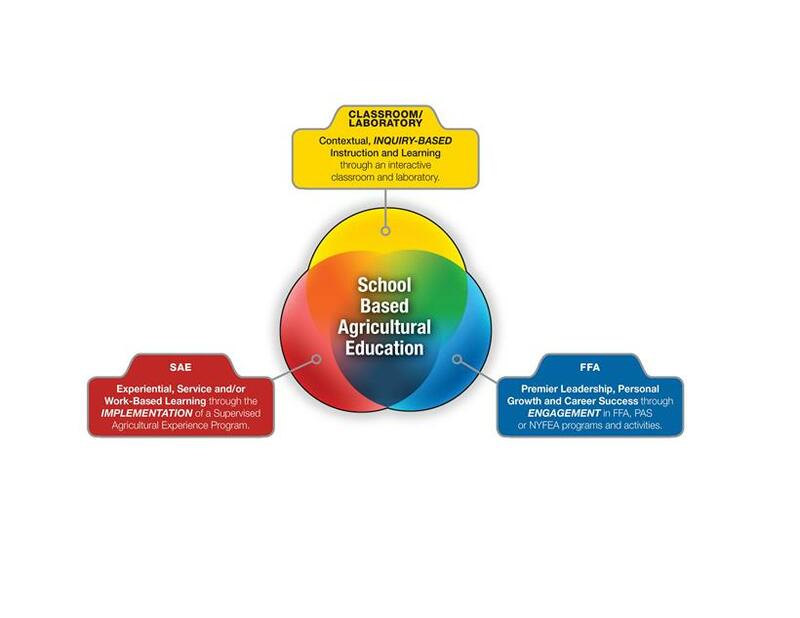 The National Council for Agricultural Education has considered these questions, and while we support that the visual representation of the program component intertwined in circles is still one of the most succinct and powerful ways to communicate our program design, it may be necessary to provide the potential viewer greater context and a fresher graphic to capture their attention. The Council worked hard to create a design that could be used with many types of audiences. It is our desire that as professionals in agricultural education update presentations and documents they will consider using the design that was created as a result of this effort. We’ll be webcasting LIVE from the campus of North Carolina A&T with special guest speakers, interactive panels, and shoutouts to all the future teachers and agricultural education majors who have submitted photos. Go to www.naae.org/teachag/live2013.php to watch and comment using Facebook or Twitter. It’s not too late to plan your own celebration. Do something as simple as sharing the story of why you became an ag teacher with your students, or use one of our fun games or other resources to celebrate the profession of agricultural education and encourage others to Teach Ag! Agriscience Fair and National Chapter will be judged on Wednesday, October 30. Proficiencies and Stars will be judged Thursday, October 31. Convention judging is voluntary. FFA does not cover any judging expenses. Submit nominations to judges@ffa.org, please include name and email address of each nominee. Proficiency room hosts are needed on Thursday, October 31 from 10:30am -5pm in Kentucky International Convention Center (KICC). Room hosts are voluntary. FFA does not cover any expenses. Submit nominations to rcarter@ffa.org please include name and email address of each nominee. Researchers in CTE, workforce development and related fields, take note: the U.S. Department of Labor, through its contractor IMPAQ International, has announced 10 awards, comprising $80,000 total, to be granted on a competitive basis. Click here for more information. Friday, Sept 20, 2013: The Farm Bill, flying pigs, a Chipotle kerfuffle, and many other ag news items in this week’s edition.